The concrete footings and foundation plans below is one of the projects I came across that needed value engineering of all the concrete work including slabs, foundation walls, as well as footing detail for continuous and spot footing detail or post footings. The process of value engineering is intended to explore ways to not only save money thus lowering construction cost, but investigate ways that can speed up the construction. 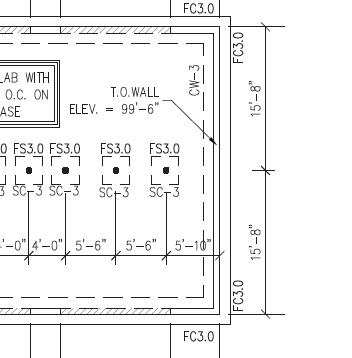 The first thing that stand out from the plan are how close the FS3 to each other. 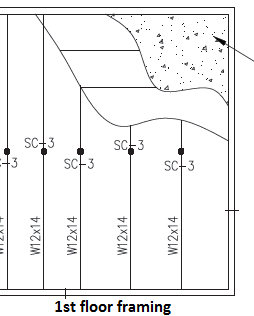 FS stands for spot footing, the number 3 stands for the width of the footing which is 3feet squared. As shown they are spaced 5’-6” and 4’-0” from each other. These are extremely close to each other. From labor stand point it takes a long time to form separate spot footing as compared to forming a continuous footing. If we combine all the spot footings as one continuous footing it will save a lot of time but a lot of forming materials as well. The other option is to pour the slab monolithic with the post footings mentioned instead of continuous footings. This is the least expensive and quickest way to do it. Since these columns are not for lateral resistance component of the structure, there is no reason this option can’t be done. With the slab and footing poured monolithic, the anchors for the steel posts can be drilled in using expansion bolts. The first floor framing plan show I beams W12x14 with SC-3 coming up from the concrete spot footings below. SC stands for steel column, 3 is the column schedule number 3 but has nothing related to the column size, in this case it is a structural steel tube HSS4x4x1/4. It is very odd that the design calls for steel column at every beam which is the reason the spot footings below are so close to each other. A possible solution in lieu of the steel columns, add one steel beam at the middle of the W12x14 so as to eliminade the steel columns and interior spot footings. Perhaps the headroom clearance might had been an issue but heavier W12x40, W12x53, W10x33, etc can certainly provide the necessary strength for the load and eliminate the need for the post footings and steel columns. Of course all these ideas to lessen cost have to be approved by the engineer on record prior to proceeding with any changes.